2 Brothers Garage is proud to offer a full range of auto repair services to vehicle owners located in the greater Portsmouth area. If you own a vehicle, you undoubtedly know that you will need to take it in for repairs at some point. 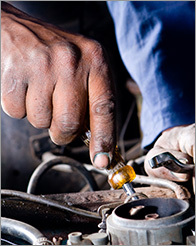 Even a regularly maintained vehicle will eventually need some kind of repair, however simple. If you are located in the greater Portsmouth area, 2 Brothers Garage can help you get your vehicle back in working order quickly, efficiently and within budget. There are few things more unsettling than malfunctioning brakes. If you are driving a vehicle sporting old or failing brakes, you are not only endangering yourself and your passengers, but every other motorist and pedestrian around you as well. Risking injury or death is not worth it � give 2 Brothers Garage a call without delay! Is your vehicle leaning to the right of its own accord? Are you having a hard time negotiating turns, or do you feel an ominous vibration when you are driving at high speed? If you answered yes to any of these questions, you might want to consider taking your vehicle in to 2 Brothers Garage's garage to take advantage of our steering repair services. Your vehicle suspension's takes a lot of abuse over time. Even if you are not in the habit of going off road, your suspension absorbs every little bump along the way, providing a smooth and comfortable ride for you and your passengers and taking a lot of strain away from your vehicle's axles. When a problem arises with your suspension, 2 Brothers Garage strongly recommends not delaying an inspection and necessary repairs to help ensure no lasting damage is inflicted on your precious investment. Your battery is an indispensable component of your vehicle. It makes it run, tick and ignite. Unfortunately, batteries are not eternal, nor are they damage proof. If you need a new battery and are in the greater Portsmouth area, 2 Brothers Garage can help.